Vitamin D test checks the level of 25-hydroxy Vitamin D in the body. Vitamin D undergoes a lot of processing in the body and the first transformation of vitamin D occurs in the liver when it is converted to 25 hydroxy vitamin D. 25 hydroxy vitamin D is good indicator of vitamin D in the body and hence it is checked in this test. Vitamin D test or 25-hydroxy vitamin D test is ordered when bone weakness or other bone disorders are suspected. Vitamin D is produced naturally by our body when skin is exposed to sun rays. 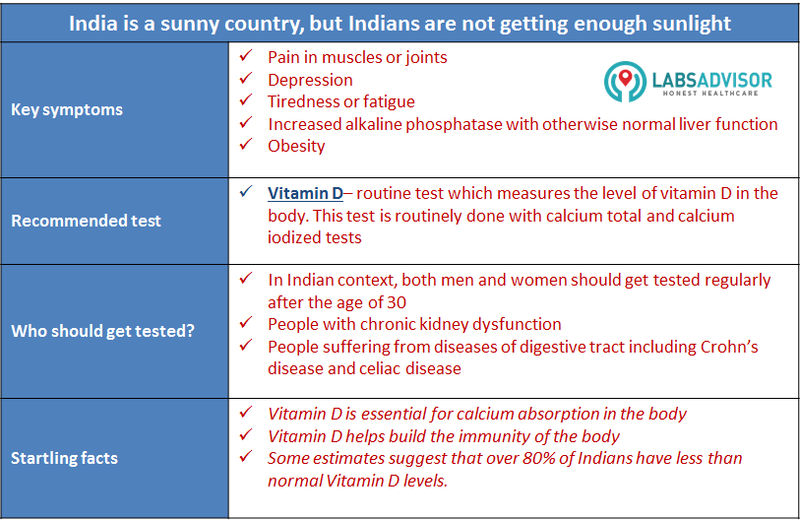 One would expect that Indians should have plenty of Vitamin D as India has abundant sunshine. However, Indians now lead the world in vitamin D deficiency. This is because people spend little or no time outdoors in the sun especially in urban India. Vitamin D is required in the body for proper calcium absorption. Lack of vitamin D can lead to body aches and brittle bones. It is also a leading cause of depression. Deeply pigmented skin, or chronic and severe lack of sun exposure for occupational or residential reasons. Chronic renal failure and renal transplant recipients. To help monitor the effectiveness of the treatment for Vitamin D deficiency. 25-OH Vitamin D deficiency provides information about the nutritional intake, sunlight exposure or intestinal absorption of the vitamin. Calcium testing is generally done in addition to Vitamin D tests. Vitamin D is essential to absorption of calcium and phosphorus in the body. Hence, calcium testing and Vitamin D testing is done simultaneously in cases where bone weakness is suspected.